Established in 2007 by Chicago-based artist and curator Dan Devening, Devening Projects features a diverse group of emerging and established international artists. Focused on site-specific installations and energetic artist pairings, Devening Projects is the anchor for a growing West Side Chicago gallery scene. The gallery also publishes experimental artists’ editions and multiples under the “Devening Editions” moniker. Hi Dan, can you talk about something you did early in life that might have foreshadowed your current curatorial practice? I don’t think there was too much in my past that might have triggered my current interest in curating; as a teenager, I was too focused on being an artist. When I was 12 and 13, I was obsessed with drawing choppers and would design my own fantasy bikes. This obsession with motorcycles was inspired by the Easy Rider poster I had on my wall. I hadn’t seen the movie. Somehow my parents let me bring that little bit of counter culture into the house despite the themes laid out in the film. This is particularly interesting as my dad was in the military and incredibly conservative. I don’t think my parents had a clue what the movie was about. I certainly didn’t; I constructed my own narrative about drug-crazed outsiders on the run from the law. That was plenty to build my own narrative about creating the perfect escape vehicle for myself. My interest in curating was triggered much later in my life/career, probably most inspired by a strong desire to collaborate with other artists on topics/themes/issues that were not part of the making of my own work or tied to my studio practice. At that time, I was living and working a pretty hermetic life—mostly studio and teaching; I saw curating as a way to work out ideas with other people that might lead to some interesting developments within and outside of what I was doing as a painter. That proved to be truer than I ever imagined. During that time, I produced a big project about every year for about five years before I decided to open the gallery. Curating exhibitions taught me a lot about connecting with people and institutions, building feasible proposals, creating budgets, understanding exhibition logistics and writing statements and press material. Very few of these things were very necessary when I worked solely as an artist. I was a content provider; as a curator, I began to shape that content into something of my own and really enjoyed—and continue to be fed by—the process. Can you describe the process of discovering an artist's work to knowing that you want to do a show? What happens…how much is instinct and how much is rational? I think it’s mostly instinct, maybe sprinkled with a bit of the rational. There is always that moment that one dreams about when you come upon something truly rare. I’ve had that experience a few times and knew instantly that the work was important. I rarely fall into an artist’s work through image; mostly I get pulled in by how the work came to be. The process, risks, failures, influences and crazy experiments are the layers of the work that I dig and that communicate to me the most. I think this probably comes me being an artist and how I think about the development of my own concerns. I know how much effort it takes to make manifest an idea…especially to do that well. I’m really drawn to that struggle when I see it in a new artist’s work. I know I’m also drawn to singularity; obsessive focus on an issue or aspect of making that makes the work strange and compelling. I wish I could name that more precisely, but in this case it’s something felt and internalized. I found that to be true of the work of Sean Sullivan, a young Upstate New York artist I found through the Instagram posts of his amazing drawings. There was something deeply driven—in an almost obsessive way—in his works on vintage papers; they drew me in immediately. I sought him out via a gallery where he was showing at the time and we started working together soon after. He’s had one solo show at Devening Projects and I’ve featured his work at EXPO Chicago and i museums and galleries in Germany. His work is constantly evolving, backtracking and reinventing itself. You teach at the School of the Art Institute of Chicago, make art, and curate. How do these things feed one another? Yes, my life is active! Teaching, making work and running the galleries can at times prove to be more than expected, but each component seems necessary and integral to the way I govern and navigate my creative life. The teaching is a vocation and an income that stabilizes me personally and the finances of the gallery. The studio work has always been a primary focus and ties me to the artists I show in the gallery and is concrete validation of my credentials as a teacher. And the gallery is a platform from which some of my ideas and passions about contemporary art can be launched. Keeping all three in balance while also having a personal life is never easy but I’ve made it work and couldn’t be happier with how it all weaves together. The gallery allows me to showcase artists—both emerging and established—that haven’t been exposed in Chicago. It was clear from the beginning that my point of view as a gallerist was different from many others in the city. I’ve always bee focused on object makers with a strong interest in Modernism and form, so early on, the gallery staked out territory that seems to interest a wide and dedicated audience. My studio practice has evolved dramatically since the gallery opened. My studio time is limited so the work has become more collage-based, celebrating the loose bits of detritus and studio material that pile up when one makes art. It also feels like a perfect analogistic strategy to how my life feels right now. Piecing together various disparate parts to form some cohesive and poetic whole permeates my thinking. I’m always looking thinking about how these loose bits might come together to make something beautiful and to communicate something meaningful; the process seems worthwhile and certainly compelling. Finally, teaching is foundational to my life. Starting soon after I left graduate school, I was teaching in studio programs throughout Chicago. I realized early on that teaching young artists requires a clear engagement with specificity. Since art can be too often formed out of ambiguity and subjectivity, I’ve always directed my conversations with student around an objective of seeking clarity, specificity and intention. That philosophy has certainly helped in my own studio work and with the gallery. Teaching is also one of the most inspiring and challenging of vocations. The challenges can sometimes be great, but the rewards often eclipse the hard parts…how’s that for a cliché? Can you name or describe anything about the Chicago art scene that feels really unique and specific to your community? What happens there that one could only experience through a direct interaction with the creative community? Chicago is unique in that we generate large numbers of artists every year from the four or five MFA programs based in the area; many of those graduates stick around Chicago to launch their careers and gallery projects. It’s always fresh, vibrant and exciting to have this new energy pulsing through the city every season. Chicago is also a small art community but it can be as compartmentalized as one found in a larger art center. We have our upper-tier galleries who have more direct access to influential collectors, curators and writers; while simultaneously being a seedbed for mid-tier and artist run projects which always generate some of the most exciting and challenging exhibitions and projects in the city. Sometimes the audiences overlap; sometimes they don’t. As a newish gallerist, it’s been interesting for me to watch and now participate in this system in a new way. In the past, primarily working as an artist, my place was pretty well set. I made stuff and looked for galleries, institutions, curators and collectors who might find the work interesting. I was reliant on this external system to drive my career forward. Now my role in the art world has shifted and my point of view has certainly changed. So many positive things have come since opening Devening Projects. Foremost, my relationship with so many remarkable artists has exposed me to ways of thinking and making that continue to inspire what’s possible in the gallery and my own practice. I have developed stronger ties with many of Chicago’s curators, gallerists, collectors and writers and the institutions with which they’re affiliated. And the scope of my project has expanded internationally via exchange shows with Devening Projects artists in New York, Berlin, Dusseldorf, Paris, Tokyo and Vienna. These shows have been exciting opportunities to expand our audience and to develop new, long-term relationships with galleries in other cities. You direct Devening Projects and co-direct Paris London Hong Kong. Do the two projects allow you to exercise unique curatorial ideas? Are there things that you would do at one gallery that you wouldn't do in the other? Both galleries offer opportunities for established and emerging artists, but Devening Projects allows for a bit more flexibility in regard to scale, space and complexity of installation. PLHK is quite a bit smaller so it requires a particular conceptual strategy to work well in that room. I am very interested in showcasing a wide range of artists and work approaches and often find that PLHK is great for younger artists interested in a very specific project. The shows at Devening Projects often feature a represented artist in one room and an emerging artist in another. I try to calibrate the pairing to allow for the most interesting conversation between the two shows. Can you talk about an exhibition that you produced that still feels really near and dear to your heart? What made this show particularly special? This of course is an impossible question to answer; especially thinking back on the roughly 80 exhibitions I’ve done since I opened in 2007! There are a few standouts of course. I’ve done two projects with New York artist Gary Stephan and both were incredible. The first was a two-person project using both gallery rooms; this show paired Gary with Chicago artist Richard Rezac. As the show ran for about 6 weeks, there was enough time and material from both artists to allow us to present two totally different exhibitions. For the second iteration, some work was removed; some work added; some shifted around to create different contexts. This was a fantastic way to address the many facets of forces present in both artists’ work. 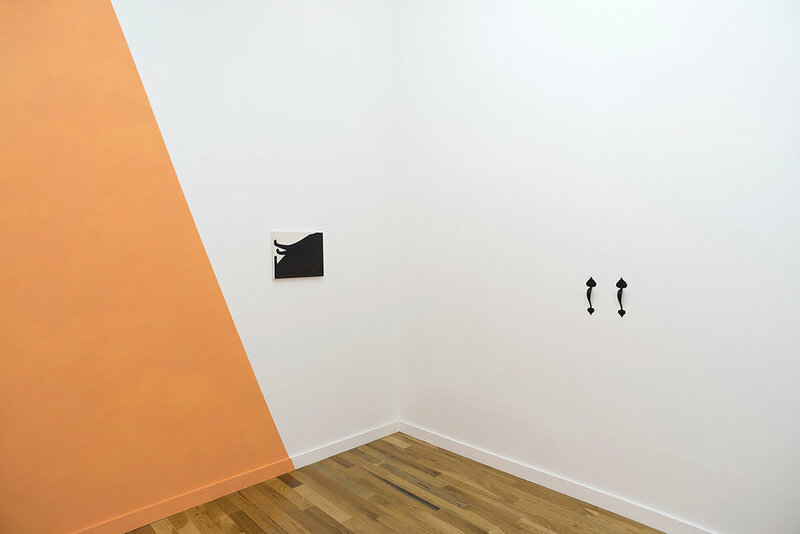 Gary’s second show featured only works on paper and was installed in a very particular way to readdress his interest in spatial anomalies and the play between the fictive space in the work and its material fact. This show was the first to feature an installation strategy that was as compelling as the individual works it featured. Other recent standouts are the two shows by Belgium painter Alain Biltereyst; the first show by Sean Sullivan and the three projects by Chicago sculptor Allison Wade. The success of these projects and every show I’ve produced is the deep connection I’ve been able to make with the artists and the collaborative way we’ve made decisions about how to make the best possible show. What would you like Devening Projects to be doing in 7 years? Like many in this nutty world, rethinking and reforming my own personal gallery platform is always on my mind. I’m not a big proponent nor do I participate in many fairs. For me the focus has always been the careful consideration and production of the exhibitions. So I’m always thinking about the gallery space and what might be possible once I move out of my current rooms. There are many exciting things in our future. Foremost, the acquisition of a new building that would tie together living space, studio and gallery. My partner Sarah and I have been working towards this goal for a while and may have found the perfect building. Still working out all the details. Obviously having the opportunity to design my own exhibition space is very attractive, but also creating a new platform to weave together more diverse programing is also in my mind. I’d like to bring in performance-based events; start to bring in overlapping design/art projects and creating more of a social space for lectures, panels, conversations. The building we’re considering is a bit outside of Chicago’s gallery district so I think we will have to think about how to expand our audience and build new interest at this location. To find out more about Devening Projects, check out the website.